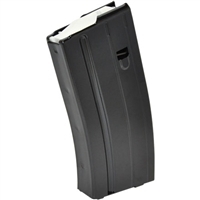 The Ammunition Storage Components 7.62x39mm magazine is the first fully reliable 7.62x39mm magazine for the AR platform. Manufactured from .020 gauge 410 stainless steel alloy and heat treated for superior strength and corrosion resistance and made from start-to-finish in the US! Enhanced anti-tilt followers, and a proprietary Marlube self-lubricating finish ensures that your rifle feeds reliably, whether it's the first round or the last.